Before last year, Menlo Park resident David Axelrod, a pediatric cardiologist at Stanford Hospital, had not heeded the call to be a medical volunteer. Standing Rock and the protests surrounding the Dakota Access Pipeline changed that. 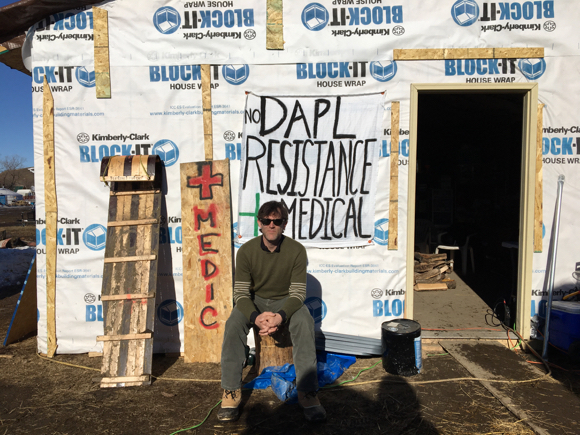 David went twice, for four days in December, where he did, as he describes “more digging out of snow, helping people build shelter” than medical work, and then for eight days in February. “I went in December on a whim,” he explains. “A local family was collecting cold weather gear and had extra space for me to stay, so I just went. David will be at Cafe Zoë on Saturday, March 11, from 5:00 to 7:00 pm, giving a talk he’s titled “Caring for the Resistance: A local physician’s experience,” to underscore that it’s his own viewpoint, which he previewed in our conversation. “In December, it was winter and all snow. By February, it was all mud. “It wasn’t only the conditions that had changed. In December, there were 10,000 people anticipating the arrival of thousands of veterans. And with the exception of a reasonable degree of security in the Indian camp, there was a tremendous feeling of community. People were helping each other out, learning from each other, being inspired from one another. In the medical tent, David said a good portion of their jobs was to “spread the calm,” when people would come in with rumors that could not be substantiated. He and his fellow medics treated a lot of anxiety, wounds and burns, respiratory infections and asthma. “The experience was both one of the most uplifting and depressing in my life,” he says. “I no longer take things for granted; I’m more aware of the struggles that different people go through. “I don’t think I’ve ever been in a situation where I felt so targeted. That’s not something we white males encounter. When I would go outside the camp, police would search my car. On the flip side, when I was in the camp, I was there as a white man, so I had it from both sides. “I also talked to the pipeline workers and got their perspective. I came to appreciate how multi-faceted and complex the situation is.